Every time I go to the farmers market, I get super inspired (sometimes even making recipe notes in my phone) buy a bunch of fresh, gorgeous produce, walk home with grandiose plans and then get busy/hot/other and wind up making this. Simple roasted veggies (any veggies you guys, fennel, zucchini, garlic heads, mushrooms, kohlrabi, you name it) and a simple fresh sauce to elevate it to a level deserving of this beautiful, local produce. Since it is literally what I make most of the summer (often in the toaster oven so that I don’t have to heat my place up with the big oven), I thought it was probably worth sharing with you. 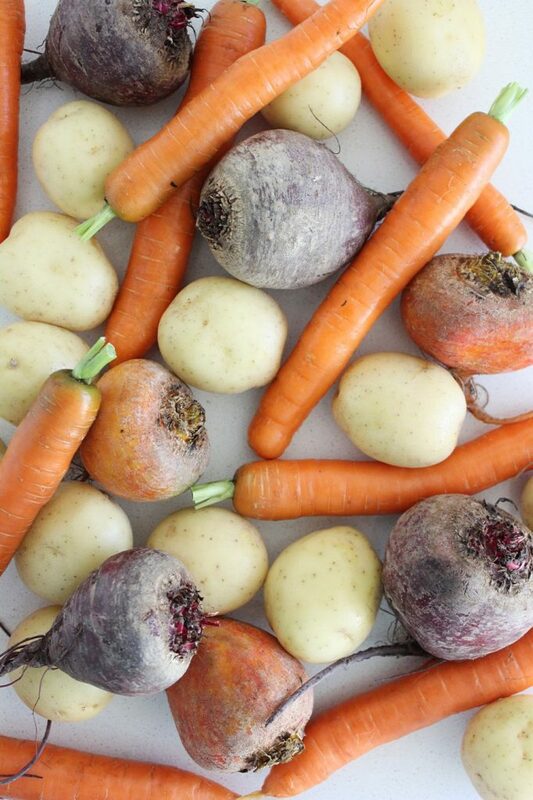 The vegetables are really simple, leave the skin on (if organic) (major flavour/nutrients/texture) cut them into sizes that you think might cook at the same rate (so that you don’t have to rescue the carrots early or leave the potatoes longer) (a lazy tip). 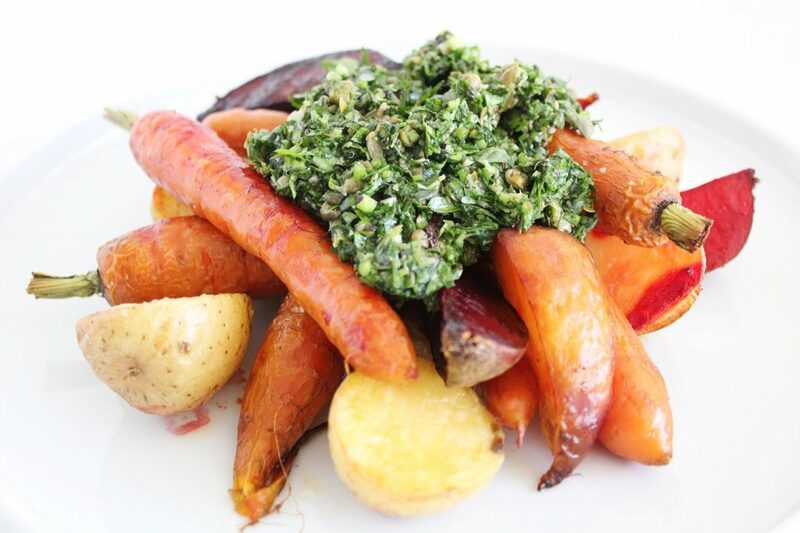 Toss with extra virgin coconut oil (you probably don’t even have to melt it right now), sprinkle with Sea(weed) Salt, and roast until tender but not total mush –you want to still be able to taste that fresh carrot inside the cooked carrot. Throw in some cooked legumes or some quinoa or millet at the very end to make it a solid meal. The sauce is the fun part (as if we weren’t having enough fun yet). The part that turns this into dinner party food or even just a solid pfo (party for one). It is totally uncooked, so no turning on any heat, and it adds a freshness back into the veggies that the mighty toaster oven took away. It’s fairly classic as far as Italian salsa verde goes (although there are various versions out there in the world) but we have subbed dulse seaweed in for the anchovies. We’ve done this in other anchovy recipes (here, here and here) and find it’s comparable in flavour. Dulse adds that undertone of umami, and is also a way to add minerals galore in a subtle, flavour-appropriate way. 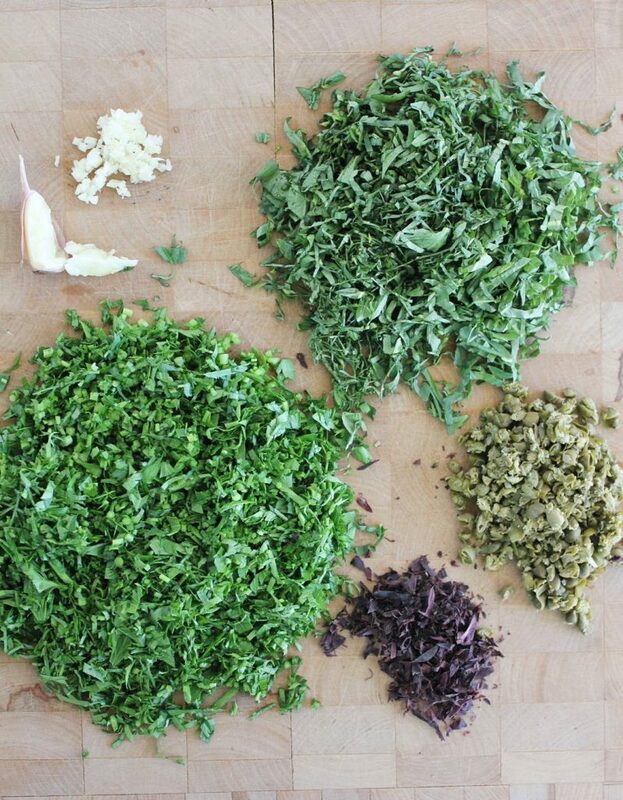 There is no reason you have to stay in Italy for this, if you like cilantro, sub the basil for cilantro (especially if you’ve just had radiation, x-rays or have just taken a lot of flights this summer), tarragon would be great too, as would mint, some chives or even finely chopped kale. 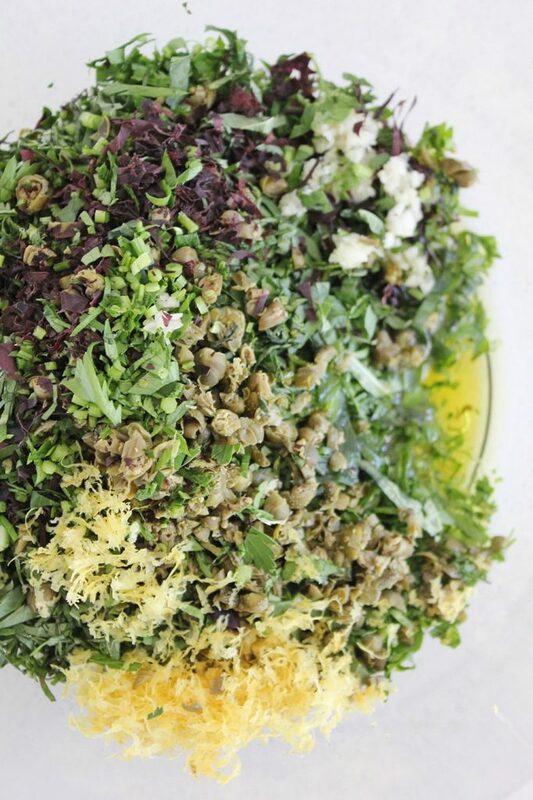 It’s a recipe that will work out with any and all of the more fragile/leafy herbs that you bought for another recipe and whose days are now numbered in your fridge drawer of forgotten greens. Although this recipe works well for a laid back summer day, there is no reason you couldn’t make it year round (but in your big oven because brrrrrr), you wouldn’t have to change anything at all. Buuuuuut, if you wanted to, try adding the salsa verde to some Eggplant Mayo, it will give it a richer, cooler weather vibe, and it tastes gooooood. Make lots because day two of these roasted veggies is a great place to be. Eat them cold out of the fridge like crudité, dipped in the leftover salsa verde (my personal fave), chop them up and throw them into a salad (elevating the salad to awesome-ville), or even add some homemade veg stock, bring to a boil and purée it up into the easiest soup of all time. 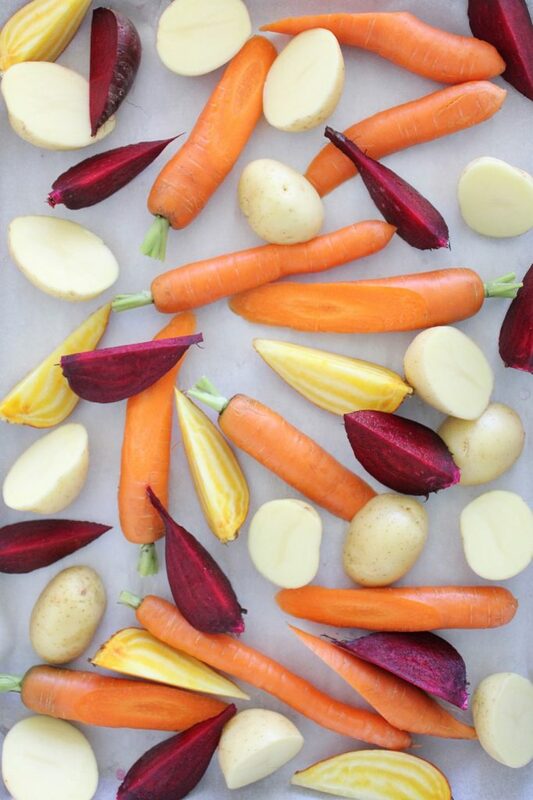 On a parchment-lined baking sheet, toss the veggies with the melted oil and salt. Roast for 40-45 minutes or until the veggies are tender but not mushy. Toss all ingredients together well. 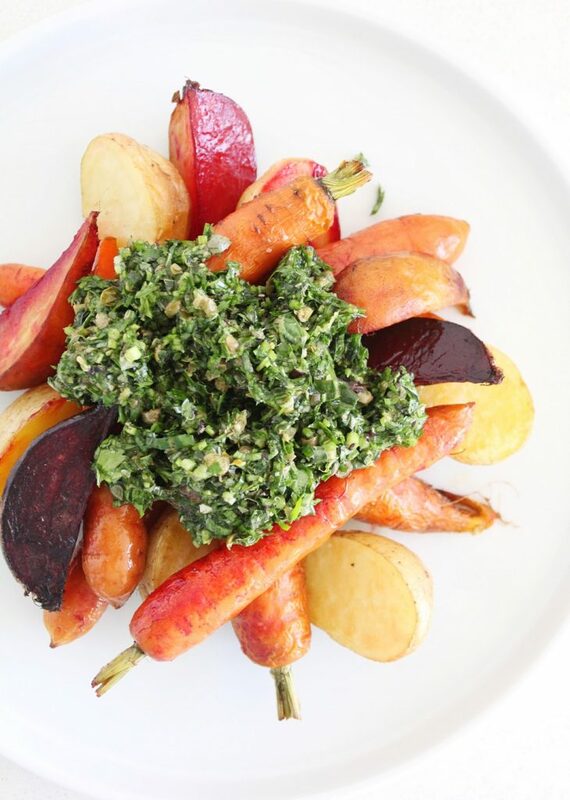 Serve on top of, or toss with the warm (or room temp) (or even cold) roasted vegetables. Optional: Instead of the chopping, put the sauce ingredients into a food processor and pulse until coarsely smooth and blended). Haha, that’s hilarious. New name: parsley crack sauce. 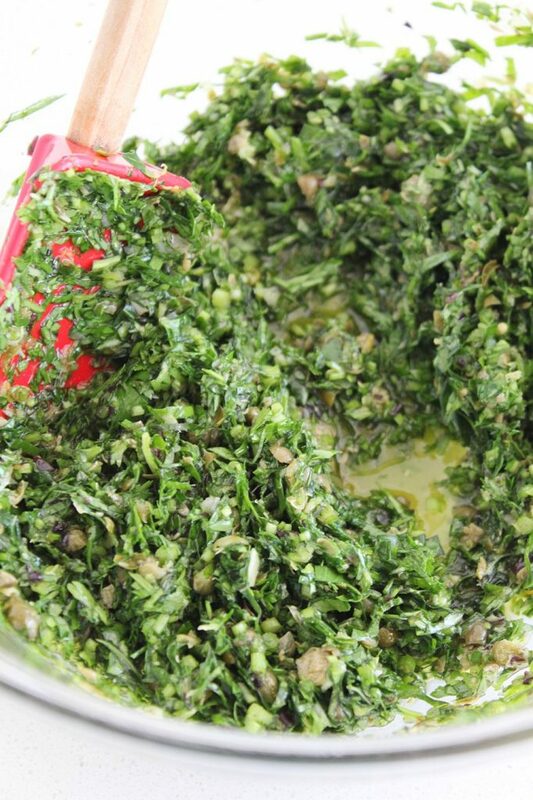 Absolutely need the recipe for that parsley finish you gave us.. that stuff is like crack. This salsa verde is outrageously delicious. Even my dad loved it!